Psalm 119:2 – Blessed are those who keep His testimonies, who seek Him with the whole heart! Our adherence to God’s Word is a direct corollary to our devotion to Him. Don’t condemn yourself or feel like because you made a mistake you are a mistake. 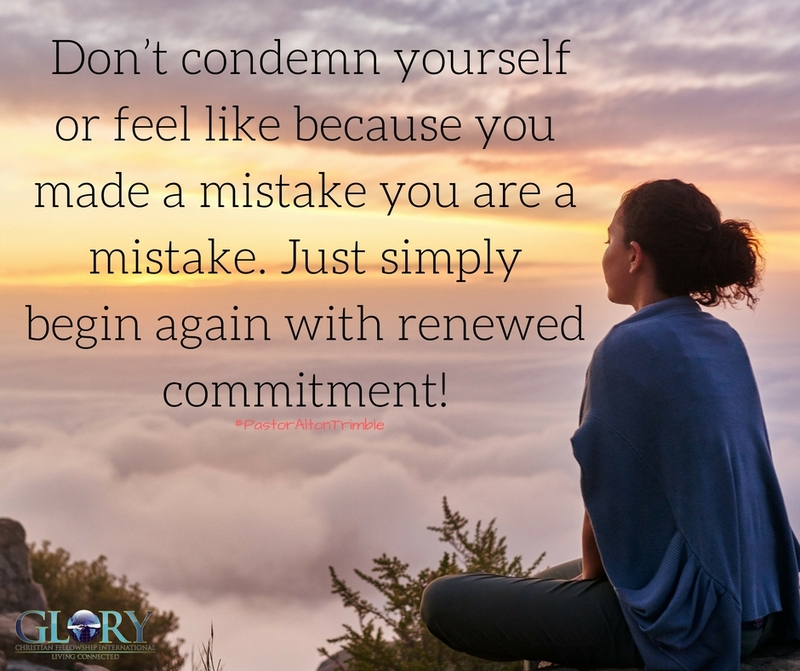 Just simply begin again with renewed commitment to not just get it right but to be right by His standards and bring glory to Him with every detail of your life. Share with someone where you may be struggling in your devotion to God. Ask for help and make yourself accountable. Father God in the name of Jesus help us in every areas of our life to do what is pleasing to you in the name of Jesus. Father I ask that you give me my family and friends a mind to not condemn ourselves! Help us to get back on the right track when we fall off the track! Let us know that we are not a mistake but that we just made a mistake! And that we can always come to you to repent and move on with no condemnation! Amen, and so it is! Heavenly Father, thank you for Jesus. Lord, help me to trust in You with all my heart, and lean not to my understanding but in all my ways acknowledge You and You will direct my path. Thank you Lord for all that you have done in my life and will continue to do, unconditionally. In your precious name, Amen. I am reminded of all the patriarchs in the Bible who made many mistakes, but they always sought the Lord and His everlasting mercies. Thank you Lord for being patient with me, and giving me the unmerited grace that I need but did not deserve. Awesome Manna again today! Thank You Lord. Heavenly Father thank You for the ability to move forward with a renewed mind and forgiveness after I make mistakes. Thank You for giving me a heart that’s not willing to condemn others for their mistakes. Father keep my heart and mind focused on You and Your will. Keep me operating in The Great Commission everyday Lord! In Jesus mighty and matchless name, Amen!